To celebrate the Gallery Cafe being 100% vegan for one whole year, and with January = Veganuary, we knew we had to bring back our Vegan Celebration! 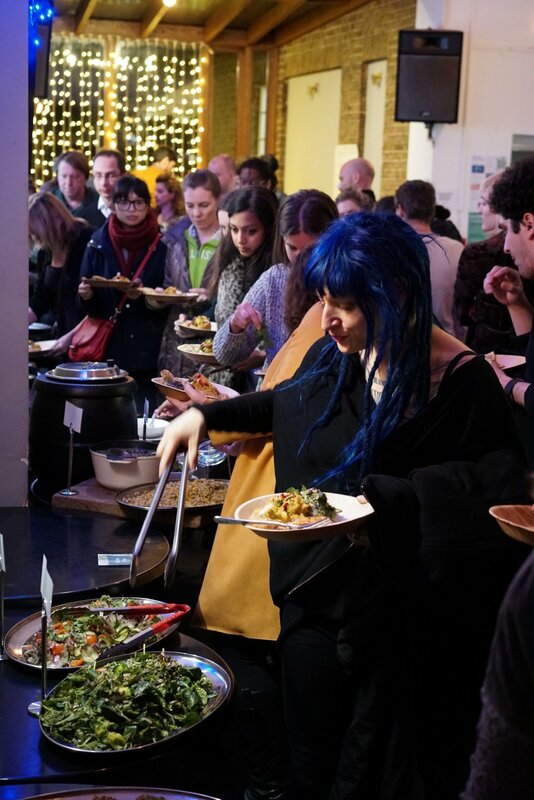 We opened up our doors for an evening of gourmet vegan food and special guest performers, with the night being a testament to how great being vegan can really be. The hilarious and award-winning comedian Dave Chawner, as seen on BBC, ITV and Channel 4. Dave recently took his show C'est La Vegan to the Edinburgh Fringe, selling out all is his nights to rave reviews. His act is all about the origins of food, ideas and views. It uses comedy to tackle misconceptions about veganism, benefits of a vegan lifestyle and the importance of looking at where things come from. Bridget McKenzie also joined us for an engaging talk. Bridget is the founder of Climate Museum UK - a mobile and participatory programme of conversational activities, diverse voices and creativity. One of the project's aims is to encourage reflection and change in areas such as diet and our relationship to other species, shifting the focus from consumer responsibility to the producers. The compassionate and energetic tour de force that is Matt Hoss also delivered a brilliant comedy set. His comic styling revolves around playful self-deprecation, whilst approaching anecdotes with severe honesty and confessions about his family, love-life and… embarrassing secrets. Our chefs also prepared a delectable set of bites that are not seen on our regular daily menu.Treats on the nights included everything from gyoza, to pizza bites, to Makhani with fried seitan, red chilli and coriander!